Are you excited to launch your systems administration career, but fear that your resume needs a disaster recovery plan? This sample can help. To be a successful candidate for tech jobs, resume expert Kim Isaacs says it helps to have a comprehensive resume. Are you excited to launch your systems administrator career, but fear that your resume needs a disaster recovery plan? 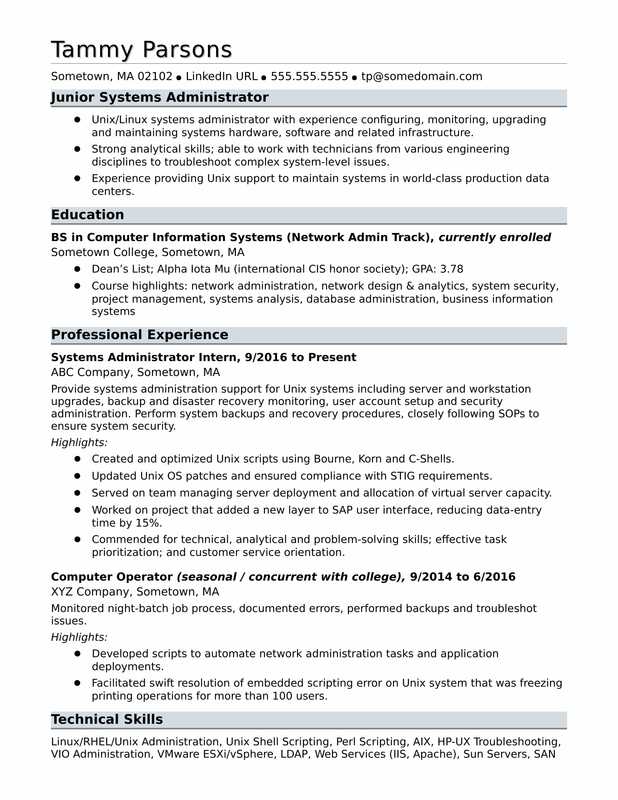 View this sample resume that Isaacs created below, or download the entry-level systems administrator resume template in Word. Jobs for systems admins are projected to grow by 6% (or 24,00 jobs) from 2016 through 2026, according to the Bureau of Labor Statistics (BLS). If you're curious about where in the country this industry is flourishing, you'll find the highest level of employment for systems administrators in the following states: California, Texas, New York, Virginia, and Florida; and in the following metropolitan areas: New York City, Washington D.C., Dallas, Los Angeles, and Chicago. In terms of salaries, as a systems admin, you can expect to earn a median wage of $81,100 per year, or $38.99 per hour, according to the BLS, though the starting salaries for entry-level positions are obviously lower. Unix/Linux systems administrator with experience configuring, monitoring, upgrading and maintaining systems hardware, software and related infrastructure. Provided systems administration support for Unix systems including server and workstation upgrades, backup and disaster recovery monitoring, user account setup and security administration, Performed regular system backups and recovery procedures, closely following SOPs to ensure system security. Created and optimized Unix shell scripts using Bourne, Korn and Bash shells. Updated Unix OS patches and ensured compliance with STIG requirements. Served on team managing server deployment and allocation of virtual server capacity. Worked on project that added a new layer to SAP user interface, reducing data-entry time by more than 15%. Commended for technical, analytical and problem-solving skills; effective task prioritization; and customer service orientation. Monitored night-batch job process, documented errors, performed nightly backups and troubleshot issues. Developed scripts to automate network administration tasks and application deployments. Facilitated swift resolution of embedded scripting error on Unix system that was freezing printing operations for more than 100 users. You're fluent in more than a few languages, but unfortunately, that knowledge doesn't translate when it comes to resume writing. Could you use some help with that? Get a free resume evaluation today from the experts at Monster's Resume Writing Service. You'll get detailed feedback in two business days, including a review of your resume's appearance and content, and a prediction of a recruiter's first impression. Let Monster's experts bring your resume up to code.